CN#45329/853 was built in 1957 for Canadian Pacific Airlines and registered as CF-DRC. Aircraft served Greenlandair as OY-DRC "Amalik" from 1971 to 1979. Greenlandair was established on 7 November 1960 as a joint venture between SAS (Scandanavian Airlines System) and the Danish mining company Kryolitselskabet Øresund which had operations in Greenland. Two years later, the Greenland National Council and the Royal Greenland Trading Company came aboard as equal shareholders. The airline's initial purpose was to resupply four American early warning radar stations that stretched across the island- for this, a DC-4 was chartered from Iceland and 2 Sikorsky S-55 helicopters were chartered from Canada. Not long after the resupply flights began that passenger services were started using a ski-equipped De Havilland Canada DHC-3 Otter and a Consolidated PBY Catalina outfitted to carry 20 passengers. In the early 1960s, there were only two airports in all of Greenland outside of the USAF base at Thule in the extreme north- Kangerlussuaq (back then called Sondrestromfjord AB) and Narsarsuaq (back then called Bluie West One AB). With a string of coastal communities that lacked airports, the Catalina was ideal as it could alight in the adjacent fjords, but an accident in 1962 involving the Catalina had the airline shift to the use of helicopters and in 1965 three Sikorsky S-61s fitted out for passenger services were delivered from the manufacturer. Six heliports were built in the coastal communities. With eight S-61s by the early 1970s, Greenlandair soon had the most extensive helicopter route network of any airline in the world. The need for long range flights to Denmark and North America still existed, and the chartered DC-4 was replaced in 1963 by another DC-4. It flew as far east as Copenhagen and NAS Keflavik in Iceland and as far west as the NORAD radar stations in extreme eastern Canada. 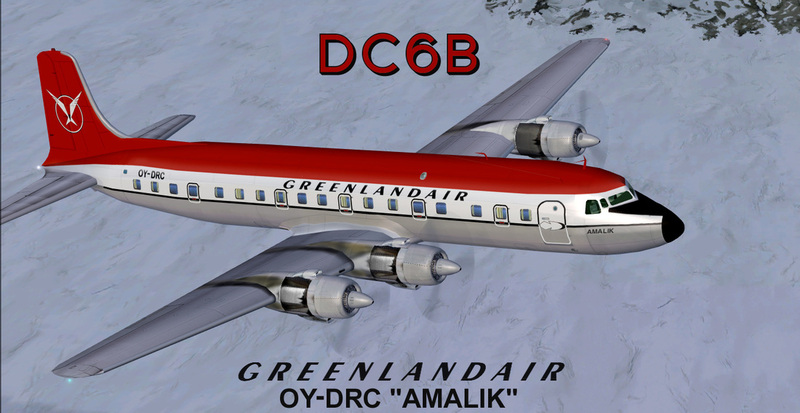 Two DC6Bs were purchased in 1971 to replace the single DC-4. OY-DRC "Amalik" and OY-DRM "Sululik" flew with Greenlandair till the 1979 - 1980 period. Aircraft went on to serve other airlines and at present it is a museum piece from what I understand.